Through tax-deductible donations, your support assists with program development, residential, recreational, and educational opportunities. There are many giving opportunities for individuals, community foundations, and corporations to donate to Sunnyhill. We are always looking for contributions of food and personal care items, as well as, event venues, entertainment opportunities, and services. Some organizations match the donations that are made by their employees. Check with your employer to see if they will match your donations to Sunnyhill. A personal and special way to thank someone who is currently living or deceased. We are always looking for inspiring and active members of the community to help raise awareness and funding. Any nominal donation to Sunnyhill is appreciated. Each cent helps us take care of the individuals that we serve helping us fulfill our mission. Another way to support Sunnyhill is through our fundraising events. Click the button below to learn about Sunnyhill's upcoming events! 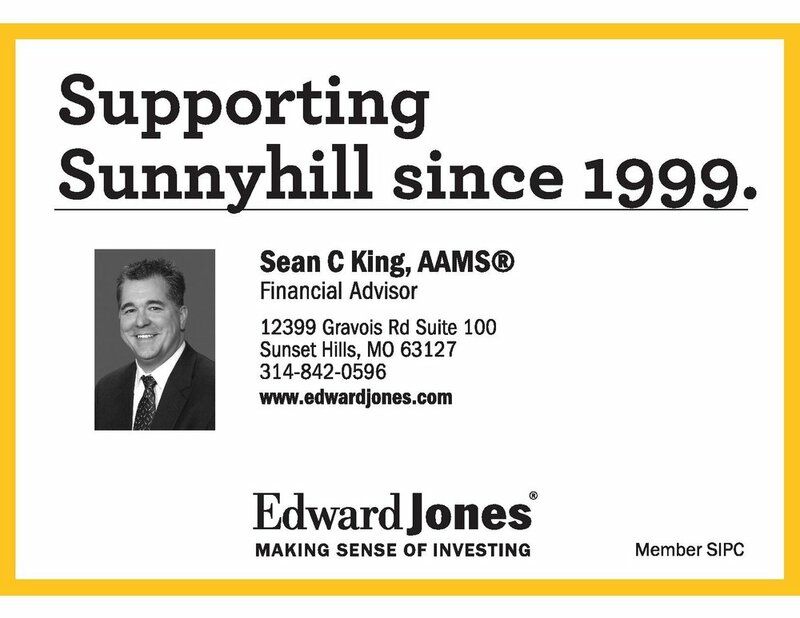 We would love for you to join Sunnyhill as a Community Partner. This extended level of commitment entitles your business or organization to various levels of support complete with a chance to advertise through a number of sponsorships including signage at our events. Partnering with Sunnyhill gives you an association with one of the leading organizations serving adults and children with developmental disabilities in the St. Louis Area. If you are interested in becoming a Community Partner, please click the button below! thank you so much to those who have already partnered with sunnyhill as a community partner! We would love for you to attend our all of our events. Every year Sunnyhill hosts a Trivia Night, The Jim Hart Celebrity Golf Classic, a Summer Golf Tournament, a Bass Tournament, Family Fun Day, & Sippin'-4-Sunnyhill! To learn what events are coming up, and to find out which you would like to attend, please click the button below! We are always looking for people to volunteer at our events! If you are interested in helping out with an upcoming event, please fill out the form below! help others to understand that individuals with disabilities are just like you and I! Raising a child with a developmental disability can present special challenges. Through the introduction of F.R.I.E.N.D.S, the Family Resource and Advocacy Center in 2015, Sunnyhill can now be able to assist families in conquering these challenges by navigating them through a variety of helpful resources.